Read, Write, Connect provides integrated instruction in reading and writing paragraphs and essays with a thematic reader full of high-interest selections students will want to read and write about. The text begins with a walk-through of the reading and writing processes and then moves on to a series of workshop chapters that provide in-depth coverage of key topics like finding main ideas and drafting and organizing an essay. Throughout, the text demonstrates that academic processes are recursive, and the structure of the text reflects this recursivity: as students move from the early chapters to the workshop chapters, they build upon earlier learning, digging deeper into the material and gaining confidence along the way. The second edition offers new chapters and new features devoted to stronger, more integrated coverage of reading; expanded coverage of research and grammar; and exciting new readings, class-tested by the authors. 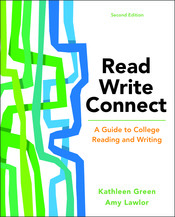 Read, Write, Connect, Second Edition, can be packaged with LaunchPad Solo for Readers and Writers, allowing you to more efficiently track students’ progress with reading, writing, and grammar skills in an active learning arc that complements the book.